This is the third and final installment in my investigation of the history of the Monkey King’s staff from the great Chinese classic Journey to the West (Xiyouji, 西遊記, 1592). The previous two articles discussed historical staves and an imperial monument that may have influenced the weapon. The current piece will focus on the name of the staff, the “As-you-wish gold-banded cudgel” (Ruyi jingu bang, 如意金箍棒). This title comes from an inscription appearing on the pole. As the novel states: “There was a line of inlaid writing near the end which said that it was ‘The As-you-wish Gold-Banded Cudgel. Weight: 13,500 Catties’” (17,550 lbs / 7,960 kg) (Ruyi jingu bang zhong yiwan sanqian wubai jin, 如意金箍棒重一萬三千五百斤). The significance of the gold bands (jinggu, 金箍) was discussed in the first article, so it will not be covered here. This leaves “As-you-wish” (ruyi, 如意) and “Weight: 13,500 catties” (zhong yiwan sanqian wubai jin, 重一萬三千五百斤). In this paper, I will trace the origin of each concept and tie them back to Chinese literature, history, and religion. As always, I hope this will be of interest to layman and researchers. Stating the weight of a weapon follows a tradition in Chinese Military Romance literature in which great heroes brandish heavy polearms and blades. For example, in Romance of the Three Kingdoms (Sanguo Yanyi, 三國演義, 14th-century), General Guan Yu (關羽) is said to have a glaive weighing 82 catties (107 lbs. / 48.5 kg). This is referenced in a subsequent novel set hundreds of years later entitled the Water Margin (Shuihu Zhuan, 水滸傳, c. 1400). In the story, the bandit-turned-Buddhist monk Lu Zhishen (魯智深) asks a blacksmith to make him a ringed monk’s staff (khakkhara) weighing 100 catties (130 lbs. / 59 kg). But when the latter refuses on the grounds that not even the legendary general would be able to lift it, Lu asks for a staff weighing just as much as Guan’s polearm to prove his equal. After some minor bickering, the two finally settle on a more reasonable 62 catties (81 lbs. / 37 kg). The ability of these heroes to efficiently wield such weapons sets them apart from normal humans. Likewise, the extraordinary weight of Monkey’s staff sets him apart from his lowly human counterparts. He is after all a transcendent immortal capable of supernatural feats of strength. This then might explain the number appearing on the staff. Thirteen thousand five hundred is divisible by nine, which Chinese numerology considers to represent “infinity”. So it’s possible the number (infinity multiplied) was meant to convey that the staff was heavy beyond comprehension, something that only a divine hero such as Monkey would be able to wield. Fig. 1 – A Ruyi scepter from the Qing Dynasty (1644-1911) (larger version). “As-you-wish” (ruyi, 如意), originates with a ritual scepter of that name shaped like an arching snake with a head in the form of a lingzhi mushroom (靈芝, a.k.a., “fungus of immortality”) (fig. 1). They are often seen carried by emperors and Buddhist and Daoist deities in Chinese art. 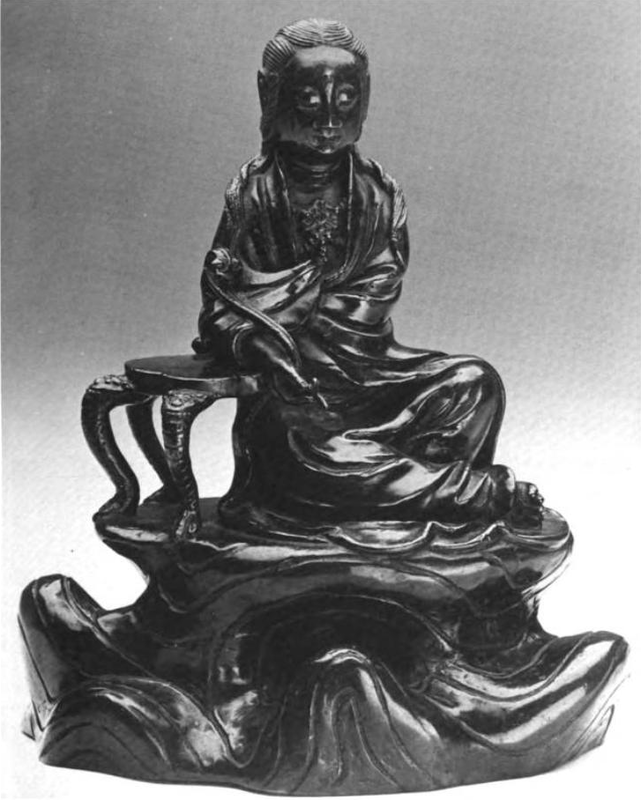 Prior to the 10th-century, the scepter was closely associated with the Bodhisattva Manjusri (Wenshu, 文殊) and his famous debate with the householder Vimalakirti (Weimojie, 維摩詰). Engravings of the event show him holding the object in the form of a tanbing (談柄), or “discussion stick”, an elongated, shoe horn-shaped wand historically used by religious and secular groups to designate the right to speak before an assembly (similar in function to the Native American “talking stick”) (fig. 2). This implement was sometimes portrayed with vegetal features. For instance, a Chinese stele from the 6th-century shows Manjusri debating while holding a sprig (fig. 3). J. Leroy Davidson suggests that this type of scepter has its origin in an Indian Buddhist Jataka tale in which a group of royal sisters use branches to initiate debates with suitors and Buddhist priests. The term ruyi comes from the “wish-fulfilling” Kalpavriksha tree of Hindu mythology. This is suggested by a Chinese source from the 7th-century which notes that, during the celebration of Upavasatha,  lay hosts often gifted “ruyi shu” (如意樹), or “As-you-wish trees” (no doubt saplings or branches), to Indian Buddhist priests . It’s possible that these gifts served as unofficial symbols of the priests’ authority and combined with the aforesaid tradition of debating with branches. This would explain why an instrument of debate would carry the ruyi title. Fig. 2 – (Left) Examples of tanbing-style ruyi from 8th-century Japan (larger version). Due to slow culture transmission, these could be reminiscent of early Chinese scepters. Fig. 3 – (Right) Manjusri holding a sprig while debating Vimalakirti. 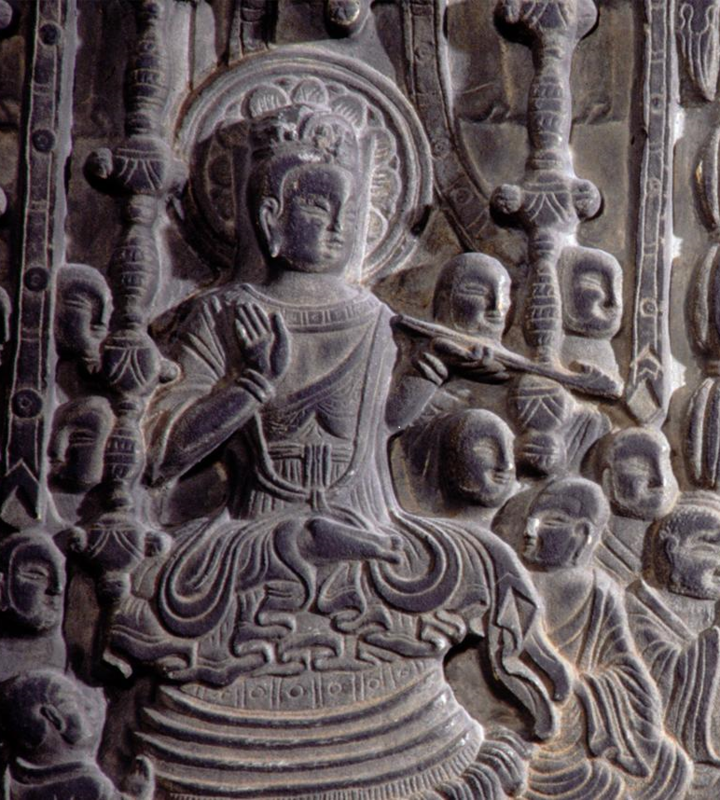 Detail from a Chinese Buddhist stele dated 533–543 (larger version). Due to its historical association with military command, Literati ignorant of the scepter’s original function as an instrument of religious debate and authority came to consider the ruyi a type of weapon. 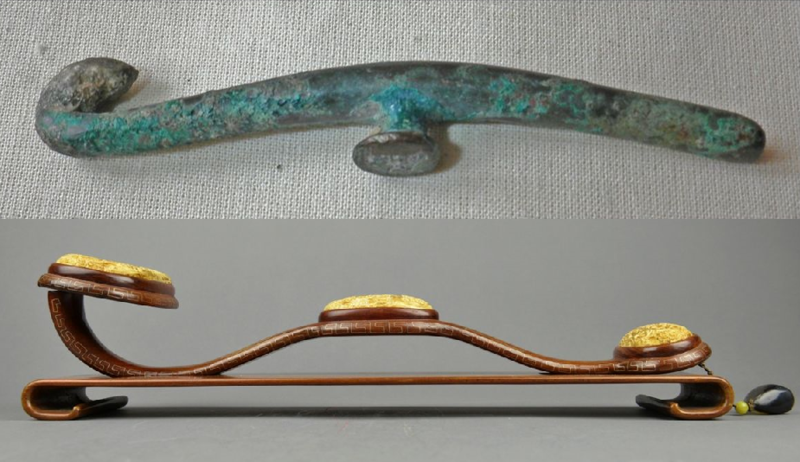 For example, the Song Dynasty (960–1279) archaeologist Zhao Xigu (趙希鵠, c. 1195–post 1242) described the object as an iron club used for self-defense: “The men of old used the Ruyi for pointing or indicating the way, and also for guarding themselves against the unforeseen. It was made of wrought iron, and was over two feet in length…”  Zhao’s words were later echoed by the art collector Wen Zhenheng (文震亨, 1585–1645) during the Ming Dynasty (1368–1644). The concept of an “As-you-wish” iron club used for self-defense no doubt influenced monkey’s staff. This is especially true since Wen shows the idea was current during the time that the Ming version of the novel was published. So how did the scepter come to have its signature serpentine curve and ornate head? J. Leroy Davidson believes this is a simple case of misidentification. He cites material from the Song Dynasty concerning people digging up a “a bronze box in which was a white ruyi decorated with motives of a dragon and tiger”. Davidson suggests this archaeological artifact was actually a belt hook commonly worn during the Zhou and Han Dynasties (11th-c. BCE to 3rd-c. CE). Said hooks have an S-shaped curve and the accompanying buckles are often decorated with real and imagined creatures like those mentioned above (fig. 4 and 5). It’s easy to see then how ancient belt buckles—perhaps the features weathered by time—could have been confused with a mushroom. Fig. 4 – (Left) A profile comparison of a Han era belt hook (top) and a ruyi (bottom)(larger version). Fig. 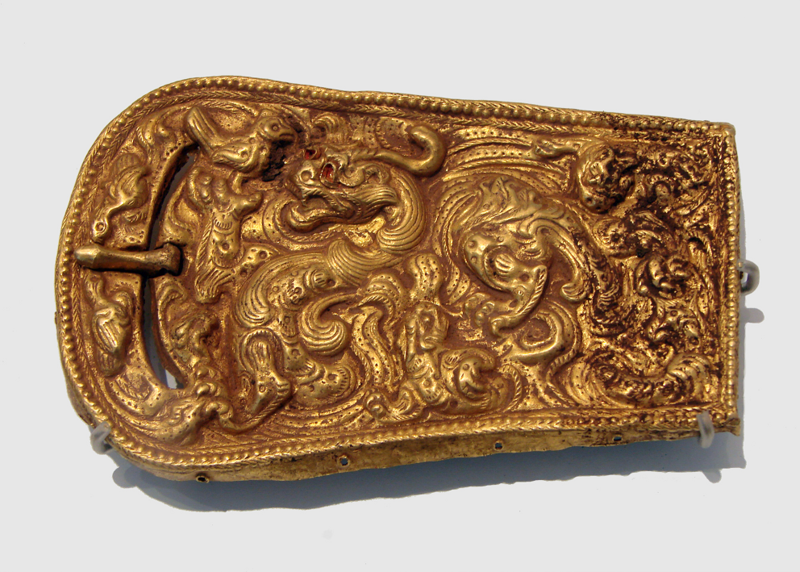 5 – (Right) A Han belt buckle featuring a dragon (larger version). Just like the Vedic Soma and the Greek Ambrosia, the Chinese also had a magical, life-prolonging substance which they called Zhi (芝). 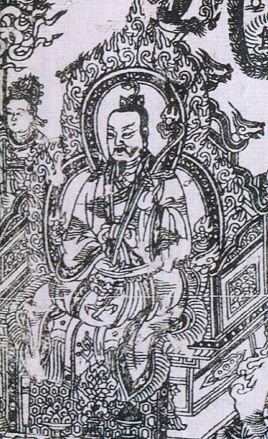 The Records of the Grand Historian (Shiji, 史記, c. 90 BCE) mentions that the emperors Qin Shihuangdi (秦始皇帝, 260–210 BCE) and Han Wudi (漢武帝, 156–87 BCE) sent thousands of men over many years in search of magical islands housing this immortal herb. 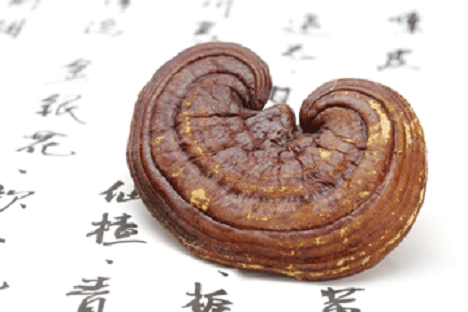 It was during the time of the latter that the substance was equated with lingzhi (靈芝, Ganoderma), a genus of spade-shaped mushroom with a lacquered appearance (fig. 6). This fungus became the subject of esoteric texts starting from the Han Dynasty, many of which are now lost. Drawing on these extinct texts, the Daoist adept Ge Hong (葛洪, 283–343) was the first to classify the lingzhi into five major types. Methods For Planting the Zhi Plants (Zhong zhicao fa, 種芝草法), a late Six Dynasties (220–589) text attributed to the Daoist god Laozi (老子), details how to seed this magical fungus by burying precious substances, such as gold or cinnabar, on a mountain side during solstices and equinoxes. Originally written during the Song Dynasty, a Ming edition of Classification of Supreme Numinous Treasure Mushrooms (Taishang lingbao zhicao pin, 太上靈寶芝草品) lists one hundred twenty-six different kinds of immortality-bestowing fungi. It’s important to note that this text became part of the official Daoist Canon (Daozang, 道藏) during the mid-15th-century. This means immortal mushrooms are a central tenet of Daoism. Fig. 6 – A lingzhi mushroom. Daoism adopted the ruyi centuries prior to the Song Dynasty when the lingzhi mushroom was associated with the scepter. It was one of the few ritual objects permitted Daoist monks living in medieval Chinese monasteries. In fact, one early Tang Dynasty text states that it is among the items that “are essential for all Daoists, whether male or female, when they present offerings”. Possibly taking a cue from Buddhist depictions of Manjusri, Daoists of the Tang began to depict some of their supreme deities with the scepter. For example, a late 7th- or early 8th-century statue of Laozi depicts him holding a straight tanbing-style ruyi (fig. 7). After the lingzhi imagery was absorbed into the scepter, it became closely associated with the Celestial Worthy of Numinous Treasure (Lingbao Tianzun, 靈寶天尊), one of the Three Pure Ones (Sanqing, 三清), a trinity representing different aspects of the Dao (道). 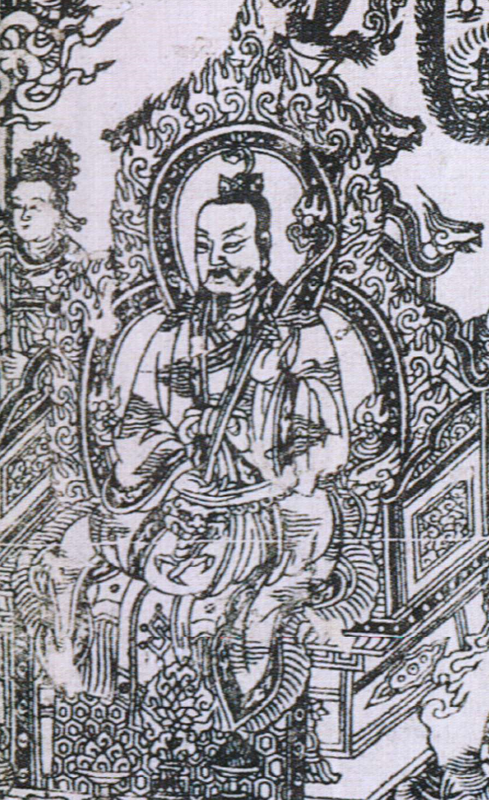 A 14th-century woodblock print depicts this deity holding a large mushroom ruyi—called by one scholar “his principle attribute”—while sitting on a heavenly throne surrounded by a sea of celestial beings (fig. 8). The scepter was later associated with other Daoist deities during the Ming. Therefore, the long association of the ruyi with Daoist immortals explains why Monkey would come to wield such an instrument with that name. Fig. 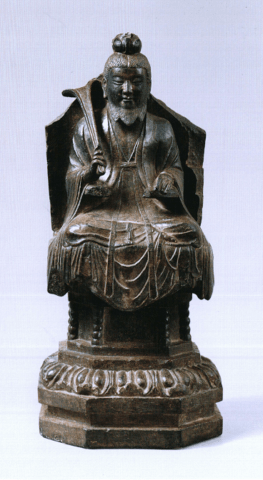 7 – (Left) A late 7th- or early 8th-century statue of Laozi holding a straight tanbing-style ruyi (larger version). Fig. 8 – (Center) A 14th-century woodblock print depicting the Celestial Worthy holding a linzhi ruyi. (larger version). Fig. 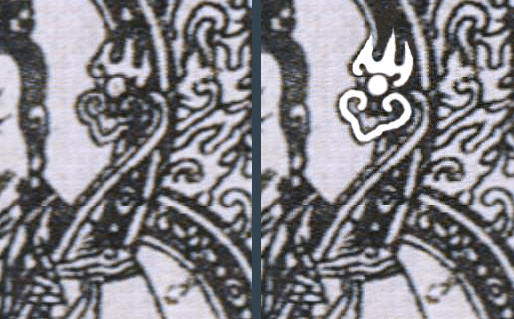 9 – (Right) Detail of a Cintamani or “wish-granting pearl”. That’s how the rod behaves accordingly. The magic powers of the staff may be based on a weapon appearing in the earliest version of the novel, Master of the Law, Tripitaka of the Great Tang, Procures the Scriptures (Da Tang Sanzang fashi qu jing shihua, 大唐三藏法師取經詩話). In this 13th-century adaptation, our protagonist changes a ringed monk’s staff into a “gigantic yaksha whose head touched the sky and whose feet straddled the earth”. This means that the Song and Ming Dynasty versions of the staff both have the ability to change their size and shape as Monkey wishes. I suggested in the second article that the initial description of the weapon in chapter one as a giant pillar of black iron is based on the famous Iron Pillar of Delhi, a religio-political Indian monument of the 4th-century. A warrior wishing to wield such a pillar would naturally need to shrink it down. Therefore, the “wish-granting” ruyi concept was probably associated with the shape-changing abilities of the ringed monk’s staff and applied to monkey’s signature iron weapon. In conclusion, the inscription on Monkey’s staff stands as a microcosm of Chinese literature, history, and religion. The weight harkens back to Yuan and Ming (13th-c. to 17th-c. CE) Military Romance literature in which great heroes are distinguished from normal humans by their ability to brandish extremely heavy weapons. Monkey’s ability to wield a staff weighing nearly nine tons elevates him above his human counterparts as a divine hero with herculean strength. The ruyi (如意) concept is much older and can be traced back to ancient India. The term is based on the Kalpavriksha, or “wish-granting” tree, of Hindu mythology. This element of Hindu culture was absorbed by Indian Buddhism and mixed with a separate tradition to become a symbol of religious debate and authority. Upon entering China during the Han Dynasty (206 BCE–220 CE), this branch was stylized into a tanbing (談柄), or “Discussion Stick”, which later became the emblem of the Bodhisattva Manjusri. It was simultaneously adopted by aristocrats and military commanders in subsequent dynasties as a sign of their secular power. The object attained its current S-shape and ornate head during the Song Dynasty (960–1279) when historical archaeologists happened upon ancient Chinese belt hooks and buckles from the Zhou and Han Dynasties (11th-c. BCE–3rd-c. CE) and confused them for such scepters. There are three reason for the ruyi term being applied to Sun Wukong’s magic weapon. First, due to its historical association with military commanders, literati during the Song and Ming Dynasties came to look upon the object as an iron club used for self-defense. This would be perfect for protecting Monkey’s Buddhist master Xuanzang (玄奘) during their journey to India. Second, the head of the scepter was associated with the immortality-bestowing lingzhi mushroom (靈芝) during the Song Dynasty and became the emblem of the highest gods of Daoism, most notably the Celestial Worthy of Numinous Treasure (靈寶天尊). This makes the ruyi an excellent weapon for an immortal macaque possessed of Daoist magic. 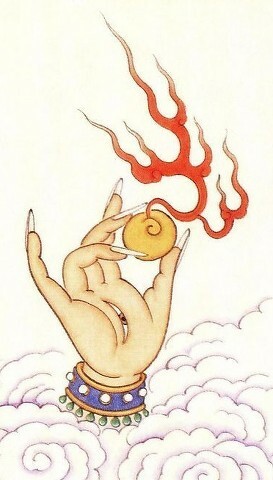 Third, the scepter was equated with the Buddhist Cintamani, or “wish-granting pearl”; this was associated with the magic, shape-changing abilities of a literary precursor of the weapon. Hence, the Ming version of Monkey’s pole gained the ability to magically shrink or grow according to his wishes. So, in the end, we see that both Monkey and his staff straddle the Buddhist and Daoist religions. If it really is a Cintamani, this shows the association between the two happened by at least the 14th-century. This probably happened earlier considering iconography takes time to become standardized. I’ve found at least one other Chinese painting featuring a flaming pearl ruyi. 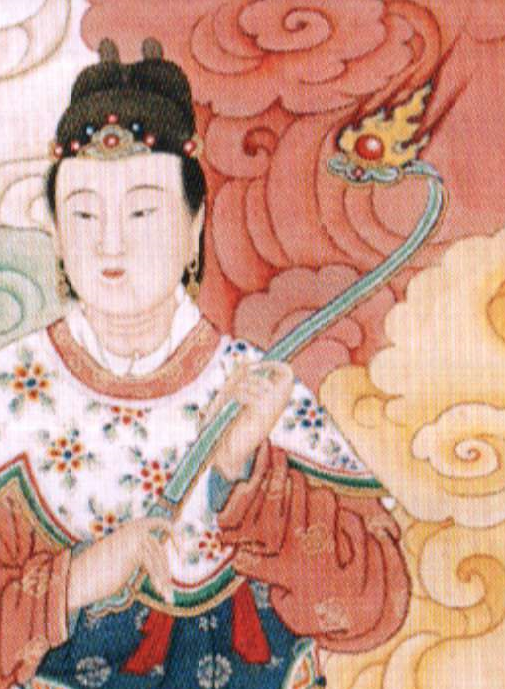 A Ming work entitled “The Lady of the Highest Primordial and the Empress of Earth” (c. 1600) features an attendant of the second deity holding the object (larger version). Wu Cheng’en and W.J.F. Jenner, Journey to the West (Vol. 1). [S.l. ]: Foreign Languages Press, 2001), 56. Text altered slightly. Compare with Anthony C. Yu’s translation: “The Compliant Golden-Hooped Rod” (Wu Cheng’en and Anthony C. Yu, The Journey to the West (Vol. 1) (Chicago, Ill: University of Chicago Press, 2012), 135). I prefer the former. Both translations use the word “pounds”; however, Chinese versions of the novel use jin (斤), known in English as “catty.” Catty and pound are two different measures of weight, the former being heavier than the latter. Therefore, the text has been altered to show this. The catty during the Ming Dynasty when the novel was compiled equaled 590 grams (Mark Elvin, The Retreat of the Elephants: An Environmental History of China (New Haven (Conn.): Yale University P, 2004), 491 n. 133). This means 13,500 catties would equal 17,550 lbs. Luo Guanzhong and Moss Roberts, Three Kingdoms: A Historical Novel (Berkeley: University of California Press, 1991), 27. Shi Naian, Guanzhong Luo, and Sidney Shapiro, Outlaws of the Marsh (Beijing: Foreign Languages Press, 1988), 94-95. Patricia Bjaaland Welch, Chinese Art: A Guide to Motifs and Visual Imagery (North Clarendon, VT: Tuttle Pub, 2008), 230. The Vimalakirti Sutra (c. 100) tells of how the Buddha chose Manjusri to call upon the malingering householder whom no other disciple wanted to visit due to his supernatural intellect. He and Vimalakirti debate Buddhist doctrine before a crowd of celestial onlookers until they realize that they are both equally versed in the dharma (Burton Watson, The Vimalakirti Sutra (New York: Columbia University Press, 1997)). For Manjusri’s association with the Ruyi scepter, see J. Leroy Davidson, “The Origin and Early Use of the Ju-i,” Artibus Asiae 13, no. 4 (1950): 240. The aforementioned sutra was not translated into Chinese until the 5th-century, so this means the ruyi became associated with the deity rather quickly. Davidson, 241-242. Medieval Chinese dictionaries refer to the ruyi as a type of backscratcher, the idea being that it can reach the areas that “one wishes” (Ibid, 239; John Kieschnick, The Impact of Buddhism on Chinese Material Culture (Princeton: Princeton University Press, 2002), 142). Ibid, 245. 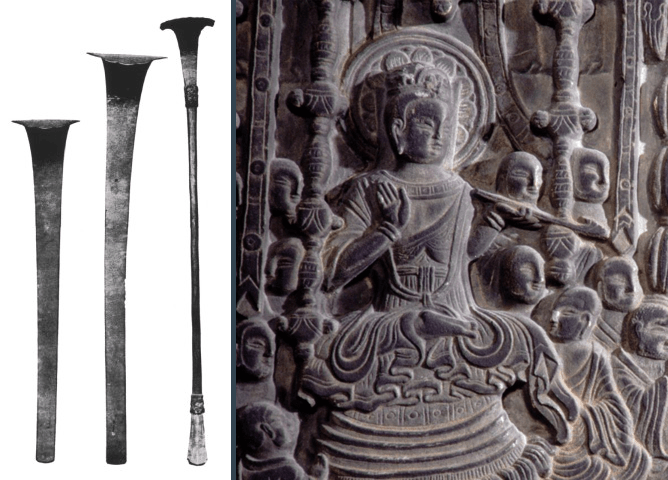 See plate IV for examples of 8th-century ruyi scepters from Japan shaped like Bamboo stalks. Ibid, 246. Davidson cites a hard to find book that is long out of print. I located an archived scan of the publication online. See “A Manual of Buddhism, in Its Modern Development (1853).” Internet Archive. Accessed December 17, 2014. https://archive.org/details/manualofbudhism00hard. The story appears on page 255. Davidson, 246. Various Puranas state that such trees arose during the churning of the ocean of milk. The gods allowed humans to wish for whatever their hearts desired until they started asking for evil things. The trees were then transported to heaven beyond the reach of man (Roshen Dalal, Hinduism: An Alphabetical Guide (New Delhi: Penguin Books, 2010), 189). A day of religious observance in which the Buddhist lay community renews their commitment to the Eightfold Path. Buddhist priests are invited into homes to help with this process (Yijing, F. Max Müller, and Junjirō Takakusu, A Record of the Buddhist Religion As Practised in India and the Malay Archipelago (A.D. 671-695) (Oxford: Clarendon Press, 1896), 35 n. 1). John Kieschnick believes the ruyi is a strictly Chinese invention (Kieschnick, 138-152). I, however, find Davidson’s arguments for an Indian origin more compelling. Joseph Edkins. “The Ju-i, or, Sceptre of Good fortune”. The East of Asia Magazine III (1904), 238. For a complete translation of the story, see John Minford and Joseph S. M. Lau, Classical Chinese Literature: From Antiquity to the Tang Dynasty (New York: Columbia University Press, 2000), 671-672. Ibid. See also Kieschnick, 144. Kieschnick refers to him by his temple name Gaozu. I have used his reign name to avoid confusion with other similarly named emperors from subsequent dynasties. Berthold Laufer, Jade: A Study in Chinese Archaeology and Religion (Chicago: Field Museum of Natural History, 1912), 336 n. 1. Text altered slightly. Laufer describes the ruyi as a blunt sword, but the available information makes the object sound more like a club. He writes: “The ruyi was used in ancient times to give directions or to protect oneself from the unexpected. It was for this reason that it was made of iron, and not on the basis of strictly aesthetic considerations…” (Kieschnick, 151). Davidson, 249. Text altered slightly. R. Gordon Wasson and Joseph Needham both suggested that Zhi was actually based on Indian stories of Soma (Paul U. Unschuld, Medicine in China: A History of Ideas (Berkeley: University of California Press, 1985), 112. Sima Qian and Burton Watson, Records of the Grand Historian (Vol. 2) (Hong Kong: Columbia University Press, 1993), 14-15 and 45-46. Despite its association with mushrooms, some texts refer to it as a type of grass or herb (Wolfram Eberhard, A Dictionary of Chinese Symbols: Hidden Symbols in Chinese Life and Thought (London: Routledge & Kegan Paul, 1986), 173-174. Xiao Tong, Wen Xuan or Selections of Refined Literature (Vol. 3) (Princeton, N.J.: Princeton Univ. Press, 1996), 201. These are stone zhi (石芝), wood zhi (木芝), plant zhi (草芝), flesh zhi (肉芝), and mushroom zhi (菌芝) (Fabrizio Pregadio, The Encyclopedia of Taoism (Vol. 2) (London: Routledge, 2008), 1273). Stephen Little and Shawn Eichman, Taoism and the Arts of China (Chicago: Art Institute of Chicago, 2000), 340. The association with the lingzhi, however, may have been as early as the Tang Dynasty (618–907). Yan Liben’s (閻立本, 600–673) “The Thirteen Emperors” painting features a monarch holding a straight tanbing-style ruyi with the head in the shape of a lingzhi. Although, the scalloped perimeter could denote a cloud. See “The Thirteen Emperors.” Digital Scrolling Paintings Project. Accessed December 23, 2014. http://scrolls.uchicago.edu/scroll/thirteen-emperors. Livia Kohn, The Daoist Monastic Manual: A Translation of the Fengdao Kejie (New York: Oxford University Press, 2004), 122. See image #39 in Little and Eichman , 183. Little suggests this could instead be a depiction of the Celestial Worthy of Numinous Treasure (靈寶天尊) (Ibid, 187 cat. nos. 39-42 n. 9). On the contrary, Silvio A. Bedini mentions an incense burner of Laozi carrying a ruyi on his famous journey to the Western Paradise (Silvio A. Bedini, The Trail of Time: Time Measurement with Incense in East Asia (Cambridge: Cambridge Univ. Press, 1994), 113). This suggests that Laozi was indeed associated with the scepter. This illustrates a scene from an important Song Dynasty text in which the Celestial Worthy is said to reveal heavenly secrets to mankind (Little and Eichman, 237-238). See, for example, Cao Guojiu (曹國舅) (Welch, 259). Erik Zürcher has suggested that the only way the lowly back scratcher could have become a symbol of lofty knowledge was via an association with the wish-granting pearl (Erik Zürcher, The Buddhist Conquest of China: The Spread and Adaptation of Buddhism in Early Medieval China (Leiden: Brill, 1997), 407 n. 59). It seems only natural that an affiliation between the scepter and the pearl would have sparked the idea that the former had magical properties. I’m not sure when the term was first translated into Chinese, but it appears in the Scripture on the Ten Wheels, a 6th-century sutra centered around the Bodhisattva Dizang (地藏, a.k.a., Ksitigarbha) (Ng Zhiru, The Making of a Savior Bodhisattva Dizang in Medieval China (Honolulu: University of Hawai’i Press, 2007), 29-30). This shows the association between the ruyi and the wish-granting pearl could be quite old. For more information on the Cintamani, see Alice Getty, The Gods of Northern Buddhism: Their History and Iconography (New York: Dover Publications, 1988), 186-187. Victor H. Mair, The Columbia Anthology of Traditional Chinese Literature (New York: Columbia University Press, 1994), 1189. For the complete story, see pages 1181-1207. H. A. van Oort, The Iconography of Chinese Buddhism in Traditional China (Leiden: E.J. Brill, 1986), 22. “A Manual of Buddhism, in Its Modern Development (1853).” Internet Archive. Accessed December 17, 2014. https://archive.org/details/manualofbudhism00hard. Bedini, Silvio A. The Trail of Time: Time Measurement with Incense in East Asia. Cambridge: Cambridge Univ. Press, 1994. Dalal, Roshen. Hinduism: An Alphabetical Guide. New Delhi: Penguin Books, 2010. Davidson, J. Leroy. “The Origin and Early Use of the Ju-i.” Artibus Asiae 13, no. 4 (1950), 239-49. Eberhard, Wolfram. A Dictionary of Chinese Symbols: Hidden Symbols in Chinese Life and Thought. London: Routledge & Kegan Paul, 1986. Edkins, Joseph. “The Ju-i, or, Sceptre of Good fortune”. The East of Asia Magazine III (1904), 238-240. Elvin, Mark. The Retreat of the Elephants: An Environmental History of China. New Haven (Conn.): Yale University Press, 2004. Getty, Alice. The Gods of Northern Buddhism: Their History and Iconography. New York: Dover Publications, 1988. Kieschnick, John. The Impact of Buddhism on Chinese Material Culture. Princeton: Princeton University Press, 2002. Laufer,Berthold. Jade: A Study in Chinese Archaeology and Religion. Chicago: Field Museum of Natural History, 1912. Little, Stephen, and Shawn Eichman. Taoism and the Arts of China. Chicago: Art Institute of Chicago, 2000. Luo, Guanzhong, and Moss Roberts. Three Kingdoms: A Historical Novel. Berkeley: University of California Press, 1991. Mair, Victor H. The Columbia Anthology of Traditional Chinese Literature. New York: Columbia University Press, 1994. Minford, John, and Joseph S. M. Lau. Classical Chinese Literature: From Antiquity to the Tang Dynasty. New York: Columbia University Press, 2000. Ng, Zhiru. The Making of a Savior Bodhisattva Dizang in Medieval China. Honolulu: University of Hawai’i Press, 2007. Oort, H. A. van. The Iconography of Chinese Buddhism in Traditional China. Leiden: E.J. Brill, 1986. Pregadio, Fabrizio. The Encyclopedia of Taoism (Vol. 2). London: Routledge, 2008. Shi, Naian, Guanzhong Luo, and Sidney Shapiro. Outlaws of the Marsh. Beijing: Foreign Languages Press, 1988. Sima, Qian, and Burton Watson. Records of the Grand Historian (Vol. 2). Hong Kong: Columbia University Press, 1993. “The Thirteen Emperors.” Digital Scrolling Paintings Project. Accessed December 23, 2014. http://scrolls.uchicago.edu/scroll/thirteen-emperors. Unschuld, Paul U. Medicine in China: A History of Ideas. Berkeley: University of California Press, 1985. Watson, Burton. The Vimalakirti Sutra. New York: Columbia University Press, 1997. Welch, Patricia Bjaaland. Chinese Art: A Guide to Motifs and Visual Imagery. North Clarendon, VT: Tuttle Pub, 2008. Wu, Cheng’en, and Anthony C. Yu. The Journey to the West (Vol. 1). Chicago, Ill: University of Chicago Press, 2012. Wu, Cheng’en, and W.J.F. Jenner. Journey to the West (Vol. 1). [S.l. ]: Foreign Languages Press, 2001. Xiao, Tong. Wen Xuan or Selections of Refined Literature (Vol. 3). Princeton, N.J.: Princeton Univ. Press, 1996. Yijing, F. Max Müller, and Junjirō Takakusu. A Record of the Buddhist Religion As Practised in India and the Malay Archipelago (A.D. 671-695). Oxford: Clarendon Press, 1896. Zürcher, Erik. The Buddhist Conquest of China: The Spread and Adaptation of Buddhism in Early Medieval China. Leiden: Brill, 1997. ← A Historical Source for Monkey’s Staff?